Ah, the accumulation of art supplies and the overstuffed studio -- I know it well. I tend to keep a lot of supplies on hand, many of which I haven't used . . . yet. I have stacks and stacks of fabric that has yet to be sewn, jars of beads and sequins and buttons that do not yet adorn anything but my studio shelves, bins full of yarn and ribbon that have not yet reached their full aesthetic potential. I think limitations can be helpful in fostering creativity. The challenge themes in Ricky Tims' digital photography class have prompted me to stretch myself and create much more interesting work than if I had free from any limitation. I had hoped to sit down and do some new textile work with limitations for this week's assignment, but I haven't had the time. So rather than delay this week's reflection any more (this is already quite late! ), I thought I would just talk about a prior project that involved limitations. Some years ago, I started a series of small works that combined photography, textiles, and quotes. I would choose one of my own photos and identify a quote that seemed appropriate. I printed out multiple copies of the photo and quotation on fabric and made several different textile pieces based on the photo and quotation. I set a couple of limitations in this project. Not only did each piece need to use the photo and the quote, but I also cut the foundation base for the pieces in advance, so I used a limited size (or set of sizes, in some cases), as well. The photo tended to set the color palette, as well, so that was also a limiting element. I really enjoy this series, and have plans to make quite a few more. The format allows me to explore different techniques and compositions within the same basic parameters. Plus, the small size makes it more likely that I can finish the pieces and doesn't involve too much commitment if one of them turns out to be less-than-successful. 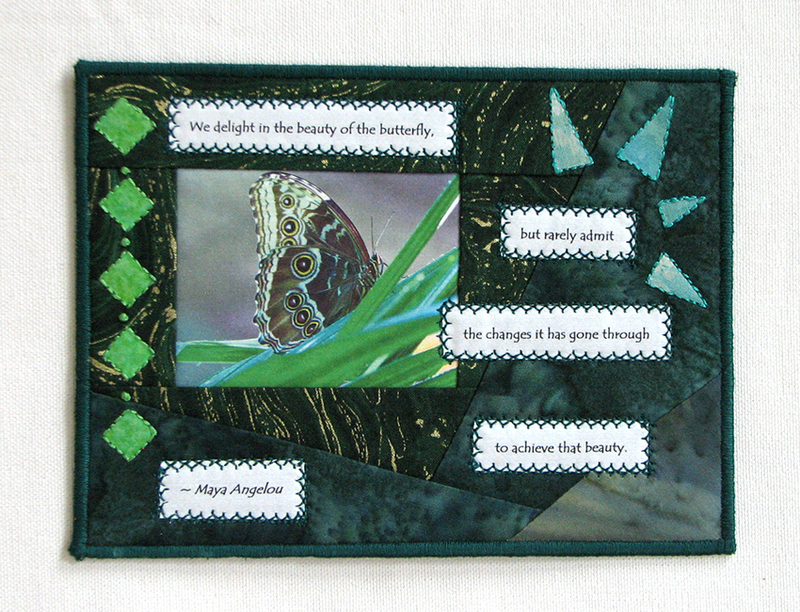 Here are photos from one set of that series (The Beauty of the Butterfly). I’m not sure why I dragged my feet on this exercise. Mostly, I think it is because the thought of a major purge of my studio is daunting; it will require a huge amount of time to execute. I know I struggle with letting go of things, as I’m still in the mindset that I’ll need all these toys when I retire from teaching in a few years, and finally have time to work at my fiber art. All this being said, I often do practice the art of organizing by tackling one small spot at a time, and enjoy watching the progress over the period of a few weeks. So, in my studio, I decided to tackle a basket of ‘ sewing stuff’ that sits beneath my sewing machine. I pulled it out, and sorted the goods. Some things could be tossed, some needed to relocate to a different and better place, and a few things went back. I’ve dubbed this basket as my ‘to do’ basket, and have put things in there that need repair, quick alteration, etc.. It sure looks better and encourages me to continue. I realize that I need to sit down and have a cup of tea and have a think. In order to tackle my studio properly, I need to decide who I am right now, as a creative person. I have so many interests, most of which utilize materials and tools. Have I moved on from certain textile arts and crafts? So, in my list-forming mode, I sat and thought about it all and mind-mapped. After that exercise, I realize, it is no wonder I feel so scattered all the time. How do I ever manage to focus. I was hoping that this task would help me sort out items I could part easily with, as I identified interests that have gone by the wayside. So far, no success, so I think I will have to have a cup of coffee next, and delve deep into the area that encompasses the material goods in my life. I do have ‘rules’ for myself, but thus far they have revolved around my closet and books (one in, one out). I have also used this with fabric purchases, which has been relatively successful. Time to move on to the art materials, if I can muster it. Surely there are some dried out old paints there somewhere. I think it would be good for me to start a rule of how many unfinished projects I allow myself to have. I sometimes approach this by challenging myself to accomplish some ‘dones’ in my life. I’ve even blogged this in past. So, I shall move on this one again. I know I can approach a use what you have rule relatively easily. I’ve done this in the pantry, and in the freezer, as purging efforts, but now, will attempt to turn it into a creative challenge for self. In my purging of the basket, I came across samples of handwoven and felting tests that were left over from a design challenge I was involved with, with the Handweaver’s Guild of America. I was matched with a weaver (I being the designer), and together we had to create something from a basket of yarn. There were six teams across the U.S. I still have some of the testing scraps (my sublimation and felting tests, as well as the weaver’s test samples). So, I’ve decided that I should do a mixed media piece utilizing one or more pieces from this bundle of goods I purged from my basket. I want to enjoy the process, so I’m not going to rush it. Rather, I hope to let this be a meditative and enjoyable process that would contrast the final days of the project way back when, as I impatiently waited for handwoven fabric to arrive so I could do my end before leaving on an overseas trip. It arrived damp, freshly fulled off the loom. Those were hectic times. So this round, I shall have a pleasant journey with it. Here are some of the samples. I do look forward to choosing one or more to proceed with in some way. As per usual, I think this shall start with a sit down and mind mapping session. I loved this weeks theme, I have had a bit of a head start though as I already had the CST book and had been working through it prior to Christmas. I seem to be unable to work in my studio if its full of clutter and untidy so over the passed couple of months I have been going through things and cleaning them up. I have taken a couple of car loads to the charity shops which is such a freeing experience, moving things on to someone else who will use it. Reorganising stuff is really rewarding because you always find something you forgot you had which I did, so it was kind of like getting a surprise. I have also been packaging stuff up to sell, I go to an art forum around Easter for a week and you are able to have a stall. So I have made up bags of ephemera and also fabric that I have collected so I can sell them. I find it liberating having limitations set it seems to free up your mind and you don’t worry about the bargain you might have missed out on at the craft store. A few years ago I set myself a challenge of not buying any new clothes, I could make them from fabric in my stash or repurpose old clothes but I couldn’t buy anything new. It was great, the time I saved by not shopping or looking on the Internet or reading the hundreds of emails from clothing stores about the bargains was amazing. I lasted a whole year, much to everyone’s shock. I agree with you Jane its all too easy to think we can’t do something unless we have the latest product when in actual fact its just a distraction. Impulse buying can be a real problem for me when it comes to art stuff, we only have one art store and a chain store selling fabric and craft so when I’m away I tend to think if I don’t get it now ill miss out. Silly really I never miss it if I don’t buy it and rarely do I really need it. The pieces of art that I have reused are the prints that haven’t worked (I do lino cuts and etching). When you do an edition of prints you always have some that don’t work, not enough ink, too much ink, registration off etc. The paper is quite expensive so I don’t like to waste it so I decided I would Eco dye them with gum leaves and other vegetation. I cut the prints into the page size I wanted and then ecco dyed the paper, when it was dry I oiled the paper with bees wax and then bound the pages into a book. before I start my week 4 I just wanted to thank folk for their comments and that I learn a lot from your posting. I haven’t subscribed to Discus , so haven’t posted comments, I just felt it was important to let you know so you didn’t think I just couldn’t be bothered to post anything. I went to collect my printing off the printer and amongstall the work stuff I’d printed off were the sheets for workshop 4. The only bit I saw whizzing back through the rain was clear out the studio…. That really resonated with me. I don’t have a studio, most of my things are stored in the loft…a bit haphazardly! So at the first opportunity I was up there. Feeling pretty ruthless. Just looking at it all was pretty daunting, so much stuff, so I decided the best way to tackle it was to start at one end and do small sections at a time regardless whether it was craft stuff or not. Some comments were: it’s taken at lot to get all that together and would take a lot to replace it…this was in regards to a surplus of ski suits. There were also lots of holdalls and comments were, but there’s nothing wrong with them why get rid of them, they might be useful, especially if we move, we’ll need bags to put things in. When I said I was going to tackle my boxes of materials next..comment were..but they really useful resources for you, it would be a shame to get rid of them…..that’s what patch work should be made out of, not buying new fabrics to cut up……I have never made anything in patch work and don’t really have any ambition too! The rest of the family do not consider them self as hoarders, in fact my husband often complains about the amount of stuff we have and we need to clear it out. Then I had a big break through moment….their stuff is useful…my stuff needs clearing…how did I come to this conclusion when it had been suggested to hold on to my material…well I looked round the house…all the coffee tables have my husbands stuff on…then on closer inspection I realised he is a real gadget man…along with one of my sons, so lots of tech stuff around. Lots of books etc. As long as my stuff….all female orientate….no surprise there…isn’t cluttering up the house then all is well. .I am the only female in our house. For the final part I choose to work with limitation. In Feb. I have a lot of birthday cards to send…so I decided rather than buy cards, using more of the worlds resources, I’d make them, using some of my fabrics….well OK I did buy a piece from the charity shop as well….difficult when you’re in there not too look! Result: I enjoyed doing them, they didn’t take long and hopefully the recipients will enjoy them too. As to the loft…well I haven’t started to sort my fabric boxes…it’s actually snowing here at the moment so rather chilly up there….but I have no intention of just leaving it, moving things does feel rather good! I love clearing things out and the way empty space makes me feel lighter and inspires me to create. We may be moving in the summer so I'm always looking for stuff I can let go to make the move easier. It sounds crazy but at the same time I'm cleaning house to move I'm applying for a full time teaching position in case the move doesn't happen. For every reason I think of to move there's another reason to stay. I don't know what will happen yet so I'm walking between two future paths right now. I would have never thought of setting limits as a way to move forward in Art but I tried the scavenge approach to an art idea and was pleasantly surprised with the results. There are children's stories I see in my head that I want to create but I get stuck whenever I try to put things on paper. Free association list and mining for meaning from an acquisition of images gave me a new way to approach old ideas that I have never done anything with. After I had a page of word images to go with the story I set a limit to the pages and did a layout of thumbnail sketches for the pictures to go with the words. The next step is to research more pictures to expand and add detail to the thumbnail sketches. Jane, did you write the "marry work and play" haiku at the end of the essay? If so, I loved the phrase--playing works! It reminded me of a children's story idea and it was fun to approach it in a different way and hopefully take it forward. I see something good happening with all these weekly projects that I didn't expect. This work feels like food for the soul. When I put time into it, whatever time I have to give, I feel validated as a person like what I think, say and do means something. It's having a positive effect that is spilling over to other areas. I didn't realize how important that was. New twist on the Committee and its ongoing effects. Dyed some fabric during a week's worth of Avoidance Behavior; wanted to make something of it; found a pattern of pinwheel designs made from right triangles cut from strips of contrasting colors. Fed into the "move(ment)" idea I had a couple days ago, but hit a significant snag. I was cutting my strips the wrong size (the directions were unclear to me) thus making the completed strips a whole inch too small for the triangles I needed to cut. Sigh. Another failed project, folded nicely and put in a box on the shelf beside the others. Mom? Any ideas what I should do? She described a way of sewing and cutting and stacking long strips into a project that would/should be simple but cumbersome. She gave me the original dimensions, which would have made a queen size blanket: FAR larger than anything I'd ever attempted nor wanted to. Plus I'd never be able to quilt it on my little Singer with the smallish throat. I tried scaling it down to more manageable numbers -- by my calculations I should have had something in the arena of 32" by 36" or thereabouts. It's 48" by 62". Not an unfamiliar size per se, as I've crocheted dozens of 4X6' afghans. Still, it's bigger than anything I've *quilted* and certainly bigger than I expected. I hung it up just loosely and had a look. I like what I got. I didn't plan for this, not at all. Which points to a problem of planning and how I never seem to get what I plan, but when I wander into a project with only a loose set of ideas I'm usually happy with what turns out. That's a topic for another day. What prompts this note? Well, I shot this photo immediately after dragging it off the machine and pinning it up. Raw, it was: I hadn't pressed it nor trimmed the edges nor even brushed off any stray threads, for I was eager to see the whole effect. I liked it. I wanted to show it off: Mom! Look! You gave me an idea and I did it and look how cool it turned out! She hadn't seen it when I called her in the evening, promised to look at it in the morning. "If you like it, I'm sure I will, too, honey," was her main critique. I felt I'd been given a nice little pat on the head and sent out to play. I get that her arthritis is troublesome, she plans her trips downstairs, and had already finished her quota for the day. I too have a finite number of steps in me per day. So I don't begrudge her sitting in her comfy chair instead of scampering down to the computer to give me the "Ooh it's so pretty, we'll hang it on the refrigerator" sort of praise I think I was hoping for. That's the rub, friends: She's not going to be giving me that kind of praise. I'm not going to be winning her approval on this one. It's a VERY SIMPLE design, and objectively not all that impressive. To compare: Her first bed-sized quilt? A bargello. King-size. Mine? See above (and it's not even really bed-sized), the directions for which I had to keep changing, when seams landed in the wrong places and colors lined up wrong and the dimensions were different every time I checked them -- the middle of the quilt kept moving!! It turned out to be a bit harder than expected, and, well, a lot of things different from Plan A, which wasn't even this quilt at all! So I went back to the other pattern, the one with the pinwheels. The one with the corners I wanted to try and match. I talked it over with Mom, we figured out the part where I found the instructions confusing, and I'm going to take another run at it. I'd really like to accomplish that pinwheel project, because it was the first "MOVE(ment)" idea I had. I'd like to try and see it through. Limiting oneself. I kinda got a head start on this one. We have to move this year, and I freeze in terror whenever I think about packing. Dear god! 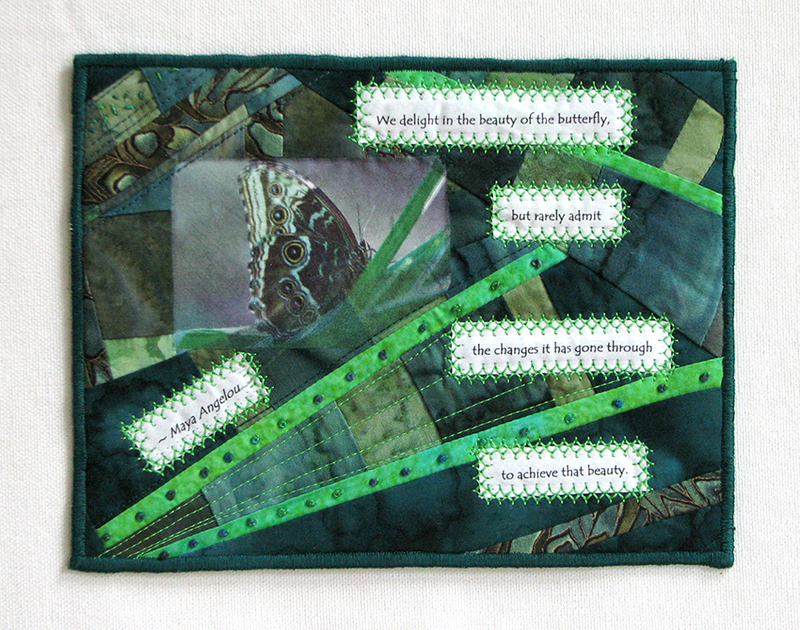 I'm a fiber artist: I am defined by my obsession about collecting odd things that will be useful in unintended ways. And then there's the panic about the move itself. Nightmare! Every move I've made has been worse than the last, and that last one was a 12-hour ordeal -- to move 12 miles! Yikes! Panic Panic Panic. Whew. More about this later. So I'm using up my dyes wherever possible. I'm sewing things together just in case they make a quilt, because that will be easier to pack than 80,000 little bits of cloth. Wondering if Novato has a city limit to how many garage sales I can hold per year. I've already taken to throwing out the JoAnn and Beverly's sales circulars before I even look at them. Danged enablers. I don't care how many percent you're discounting the rubber stamps or Ranger products. I've got rubber stamps all over my house, not including the ones I carved myself. I DON'T NEED ANY MORE STUFF!! I'm looking around my studio, wondering what I could simply bag up and take to Goodwill. I bought a bunch of fat quarter bundles of *premade* fabrics at various times during trips to Tuesday Morning stores (I love their crafts section: another enabler!). They sit crumpled in a drawer; I don't use them because I've made so many other interesting fabrics of my own. They could go. That fleece yardage over there. One purple and one fake tie-dye. I was going to make a jester's hat out of it. But heaven knows when I'll actually *make* the danged hat, so the fleece can go, too. There's an entire corner of my room cleared! Relieved sigh. Maybe I can survive this move after all. And bonus! A clear, organized studio space. Eventually. 1. Those felting forms for hats. Very specialized item. Nobody who doesn't needle felt will even know what they are. Yard sale? Puzzled looks. Sell 'em on Etsy! Those folks will know what they're for! (I might even have bought them from an Etsy seller; I forget). 2. Yard sale(s): advertise with the local needle arts' guild(s) that a FIBER ARTIST IS CLEARING STASH!! COME AND BE HEALED!! Also put notices at Dharma Trading Company and Bev-Jo's, my favorite, major enablers. 3. Organize 3-5 areas per week. That's less than one a day, so it's not too daunting -- also represents an average; some weeks may be more, some less. I have to factor in time off for resting the joints, or I will suffer mightily and never recover. 4. Remind myself of the little factoid I've learned over the years. Everything Always Gets Done. Always. The loudest word in my head/soul right now is FEAR. I am so terrified of this proposed move..when Mark told me it would be Spring not Summer I passed out cold from panic. This is not a good sign. Is there any way I can make this terror into something positive? Can I even continue to type with my hands shaking this hard? Default: fear of the unknown. Yet I'm pretty sure I know how the move will go: the movers will tell me sweet little lies; things will get broken; I will hurt myself beyond repair by pushing myself too hard. I remember the last time, a decade ago. The stress of it killed my elderly kitty cat. It nearly wiped *me* out. Good God, this isn't anything *unknown* that scares me: I know full well how awful a move can be, and each one's been uglier than the last. Yikes. And last time, ten years ago, I was able to function on my own. For instance, I was still able to drive back then. Hands now too painful to push a steering wheel through a left turn: I'm supposed to be lugging boxes around? Ah, what a mess. Ok. This whine session is not leading me to anything useful like content; just more complaints. I'm too close to it. Seems like using art to work through fear would be a good idea. It probably is. I'm just too close to it, scared to try, scared to act, scared to MOVE. [Aha!] Should I try exploring "movement"? Or perhaps "moving" is closer to the truth? Well, I have to go have an anxiety-barf now. See you later. Fast forward to January this year. I spent five days cleaning out my studio. I took eight brown grocery bags of fabric to a local church that makes charity quilts. I donated another two to Nicaragua , a box to a grand daughter, two bags to a friend, and still have a suitcase full to take to Uganda. Now my fabric shelves have fabric made by me. I am standing on my feet saying I am NOT a traditional quilter. I am an artist. I want my art to be mine. I decided if I want to make a charity quilt, I could get fabric from the church to do just that. They can house it for me. I organized my paints, dyes and supplies that went with them into tubs. My husband suggested I label the tubs…a good idea but still has not been done. Since then I have had life interfere. I am struggling with a loss of two wonderful women to nasty cancer. My comfort is to sew….so I have taken the bag of scraps that I saved and organized into bags of like colors and just sewed to hear the machine. It is mindless and comforting. My plan is not to start buying all over but to use what I have. I am allowing myself to buy more PFD fabric so I can create more of what I love. If I decide I need a fabric I gave away, I will just have to dye a fabric the color or texture I need. I think this will make me more of an artist and less of a crafter.